You’ll find Sebastian’s Bistro at Disney’s Caribbean Beach Resort! This new Table Service eatery has taken the place of the spot formerly known as Shutters. Sebastian from The Little Mermaid is a fitting inspiration, given the Caribbean feel and flavors showcased in the waterfront restaurant. The decor at the casual restaurant helps the space resemble a “tropical beachfront home,” with coral patterns, kelp filigree, and nautical art and designs. (Think about “life Under the Sea,” as Sebastian would say!) Latin flavors are also featured, blended with the Caribbean cuisine. 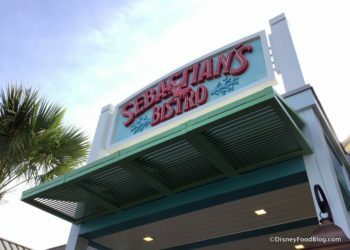 Sebastian’s Bistro brings waterfront dining to Disney’s Caribbean Beach Resort. Disney Food News This Week – NEW Restaurants, New Merchandise, and MORE!